PasPro 1 introduces a new concept. Now you can modify your retro looking solid-state or tube preamplifier by installing a modern high-performance tubed preamplifier circuit into that treasured old favorite. From the outside it still looks like it’s original self, but inside is a circuit that can perform with the best preamplifiers available. PasPro 1 is a tubed preamplifier circuit with both phono and line stages. PasPro 1 has a robust power supply integrated into the same circuit board. All you do is remove the original circuit boards and transformer of your preamp, install the PasPro 1 main board and connect a new power transformer plus various signal connections including a new volume control. PasPro 1 has a two tube phono stage with passive RIAA equalization and zero feedback. The line stage is a single tube, grounded-cathode gain block. It also has zero loop feedback. The power supply is dual-mono at the active circuit. It is a stabilized design using a POWER MOSFET for the high-voltage B+. The heater/filament voltage is regulated. It has a 30-second, relay activated, auto-mute function at turn-on time. After turn-on you can mute the preamp at your command if you connect the muting circuit to the front-panel original TONE switch. PasPro 1 has a total of three 6922 type tubes. They can be from the 6DJ8, 6922, 7308 or Russian 6N23P family. There are several variations in this family of tubes. PasPro 1 looks like it belongs in that Hafler DH-101 solid-state preamplifier chassis doesn’t it. The four mounting standoffs actually strengthen the Hafler chassis. The heater voltage regulator is bolted to the aluminum power supply partition. The rectangular yellow box is the relay that delays startup for 30 seconds when you first turn it on. We connect the relay to the now idle TONE switch so that you have a front-panel mute switch. The classic Alps Blue Beauty is a great sounding volume control. Classic Dale/Vishay resistors are used almost exclusively. In the Elite model you’ll have upgraded capacitors and resistors. That is a single power supply divided out with dual-mono final voltage taps. There are separate power supply for Phono right, Phono left, Line right and Line left. PasPro 1 line stage is the single tube at left(above), the other two are the phono tubes for the zero feedback, passive EQ RIAA stage. Those box style caps in the RIAA stage are military 0.5% tolerance film capacitors with a great, solid, clean sound. Just about any tube in the 6922 family will work in all positions with PasPro 1. Note that the Russian 6N1P is not usable. It’s a wonderful tube, but it has double the heater current requirement compared to a 6DJ8/6922. Anyone, any ad that tells you it can replace the any 6DJ8/6922 in any preamplifier is wrong. It is possible to use the board mounted capacitor positions to load your phono cartridge with alternate resistance and/or capacitance. You might see the slots there at C1, C101 to the far right. PasPro 1, the smile inducing choice, will be available to fit into classic retro preamps. The Dynaco PAS-2, PAS-3, PAT-4 and PAT-5 will all happily accept the PasPro 1. Surprise! The classic Hafler DH-101 can also house the PasPro 1. Imagine that! The best preamp you own may be the one you have relegated to a secondary system or the closet. It might be living in the attic waiting for you to make it the grand sleeper of all time. A complete Line/Phono vacuum tube preamp with superb sound at these prices. Why wait? Installation manual for PasPro 1 / Hafler DH-101 - Click here. Large PDF download. 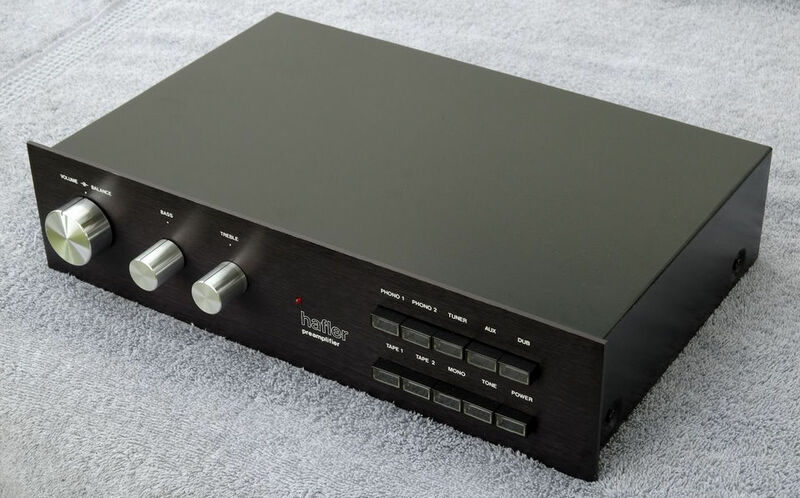 What is available for the Hafler DH-101 preamplifier? We are installing these now! PasPro 1 Basic Kit: The buyer will install and solder each component, solder is provided. This is main board only, $299. Information is provided to use your chassis, volume control, tubes and transformer. Outboard power supplies should be discussed on an individual basis.